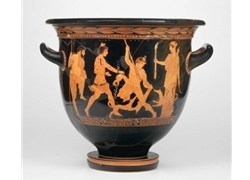 An Attic red-figured bell-krater by Lykaon Painter.Actaion is being attacked by dogs. The presence of Zeus and Lyssa is evidence relating the vase to the play. The other data used for this linkage are the tragic costuming, Aiketeon's special horn mask, and the inscriptions over the actors, including one that identifies the main figure as Euaion, the son of Aeschylus. The reverse side shows two women and a youth conversing, but neither the Museum of Fine Arts, Boston nor Trendall addresses this half of the vase. Less dramatic visually, the reverse side may still depict an important dialogue in the play or perhaps audience members reacting to the performance. Notably, Trendall claims that this vase is a depiction of a scene in performance, not merely a representation of the story.